Review: Many movies often borrow elements from movies gone by . They also might borrow from other entertainment forms, and take them in interesting new directions. For instance, if you take the time loop element of movies such as Groundhog Day, the Normandy beach landings as depicted in Saving Private Ryan, and elements from the popular video game franchise Halo. When these things are merged together, the end product is this thrilling sci-fi adventure. 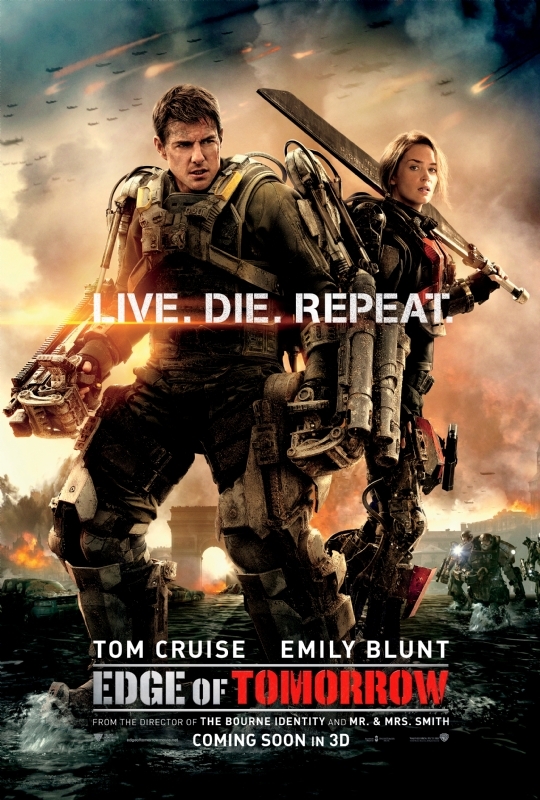 Adapted from the anime novel All You Need is Kill by Hiroshi Sakurazaka. Humanity is at war with an alien race and the troops are being rallied in England to prepare for an attack on the enemy foe. Enter William Cage (Tom Cruise), a top General in the US army who is more into talking than fighting. He ultimately is forced onto the front line to help repel the alien forces. Yet after seemingly meeting his maker, he finds himself waking up, relieving the same day again and again. As the film’s tagline goes” Live. Die Repeat.” and this happens many times. This premise may sound familiar, but with Doug Liman (Bourne Identity, Mr and Mrs Smith) on the director’s chair, what we have an innovative and refreshing perspective on this similar premise. For three decades, Tom Cruise has given us exciting action movies such as the Mission Impossible series. And yet again, he gives another enthralling performance as we see his character really progress from quite frankly a complete wimp who barely knows how to fight, to a fearless warrior determined to wipe out the foe whilst using his impressive tech suit. Despite being 52 years of age, the man can still give a solid action performance. As he falls each time, he learns something new and uses this knowledge to his benefit. The key piece in this science fiction puzzle however is Rita Vrataski (Emily Blunt). Her character has gone through something similar to Cage and he must utilise her knowledge to help win the war. The two leading actors have great chemistry on screen as she is the one who helps train him into the soldier that he needs to become. Blunt gives an exceptional performance and demonstrates that you can have a strong female protagonist who does not need a man to stand up and make herself count. In many respects in this film it is vice versa, he is the one who needs her to stand up and make himself count. Liman himself stated that the scenes with the character repeatedly dying and respawning were an intentional comparison to video games. The fight scenes are fun to watch, particularly with Cruise running in his tech suit and taking down the bad guys. While the fighting does come across as almost too video game like at times, it is intriguing and there is plenty of action here to get the heart pumping. In particular the final showdown against the aliens is fantastic to watch. The continuous loop element of the movie could be tedious and dull. Yet it works to great effect as each time Cage bites the bullet, there is something new and energising that is brought to the plot, and it effectively moves the plot forward. With elements of video games and time loops and time travel from past movies all blended together, along with a revitalising and exciting story that keeps you entertained from the word go. The final result is a film you will (hopefully) enjoy and watch many times.